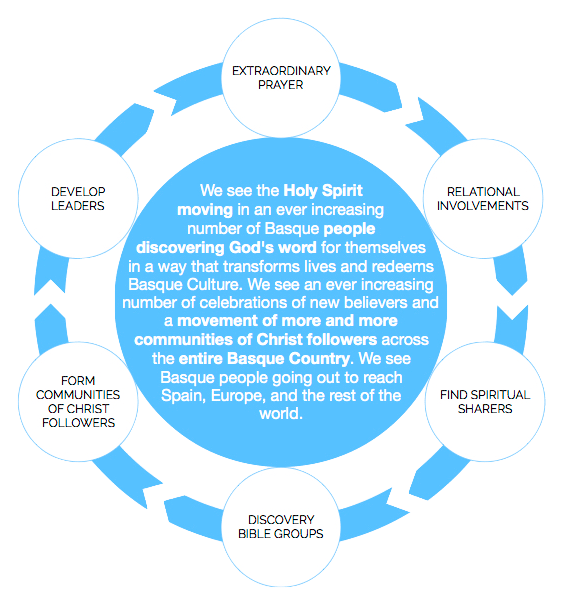 Our desire is to see a disciple making movement (DMM) happen in the Basque Country. These movements (also called church planting movements) are defined as a rapid multiplication of indigenous churches planting churches that sweeps through a whole population segment. In our context; however, the word church has lost its meaning. Therefore we prefer to describe this movement as seeing reproducing communities of Christ followers among the Basque people. We don’t seek to create an institution, but rather to see people come to a genuine love for Jesus and meet together in simple ways without the involvement of institution, money, and hierarchy. The process starts with extraordinary prayer, hence the reason for this website. Paul Watson once said in a web conference that every single CPM that has happened in the world has been preceded by a prayer movement. To get a brief (and overly simplistic) view of what we hope to accomplish you can view the flow chart below. As we relationally engage people in a variety of ways (volunteering, participation in clubs and activities, teaching English, working normal jobs, etc) we are looking for spiritually interested people. As we find these people we hope to start discovery Bible studies with them and their friends and/or family. These discovery groups will then become the building blocks that form churches and multiply across the Basque Country. Below is a video about what a discovery group looks like (more information on discovery Bible studies at dbsguide.org).